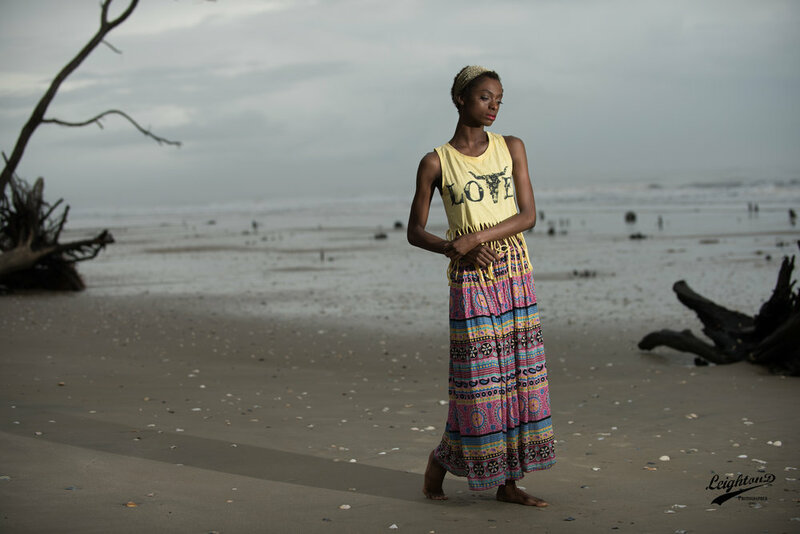 Jacksonville, FL Model: Shante Armstrong, serenely amongst the driftwood at Botany Bay Plantation in Edisto, SC. I often mentor and teach photographers; and I always try to stress to them, they need to identify THEIR own styles and evolve around that. Trends will come and go, but your style is eternal. I remember in Fashion and Editorial photography growing up, the subjects would be well defined by light, while the backgrounds would be dramatically darker to showcase the subject. This allowed your focus to be shifted to the story that was in the image. Conversely, in the past 15 years or so, there have been trends to known commonly as, "light and airy," or "dark and moody." Now, if you asked 100 photographers, what the terms meant to them, you'd probably get 100 different points of views. Overall the consensus for light and airy is, a "brighter" image where the background is dramatically brighter to showcase the subject. With the inverse being considered "dark and moody." Both usually with some some sort of color desaturation to give a more pastel look. Some consider these styles over exposed because you often lose details in the distant scenery like the sky and natural environment. While dark and moody is considered under exposed because the details in shadows become muddied and unidentifiable. Others will say it is merely "pushed" but the subject is still perfectly focused and framed. In my opinion, there is no right or wrong answer except for whether or not the client wants it. And that's just it. With most clients, If you asked theme the same question, the answer runs akin to, "I'll know it when I see it." Brides are consistently trained to look for these images and gravitate to them because they must be good. Know what YOU like when it comes to style! This is probably the major thing I want you to take away from this post. Identify what your preferred style is. If you like brighter skies and reduced details in the highlights, the third image might be your style. If you like more details in your shadows, the "darker" image might be your style. What is important is to identify that style and look for work that reflects that. If you are looking for a photographer that shoots "light and airy," look at the portfolios of photographers and see if they reflect that style. If you like dark and moody, do likewise. Where I think that we often get in trouble, both as photographers and clients, is looking at a style that we love and then going to another artist to recreate that style. In almost all accounts, the most important decider on whether something is "Light and Airy," or "Dark and Moody" for most people is not about the overall exposure of the image, but the overall exposure of the subject and the shadows and highlights falling upon the subject. Are details lost in the shadows and highlights? Does a intricately stitched, lacy wedding dress transform into an overall creamy satin because all details are lost? Does the subtle nuances of a dark fabric become a muddied mess, because the exposure value on an image is too low? These are all questions for the discerning eye of a photographer or client to answer for themselves. IMPACT. The number one thing for an image above exposure and style, is the impact of the image itself. Things like engagement, emotion, elation, etc are all important. EXPOSURE. Exposure of the subject is often more important than exposure of the scene. This is up to the artist. STYLE. Identify YOUR style. Whether photographer or viewer. Some people like mountains, some people like beaches, some people live in California. Meaning, your style can be fluid and doesn't have to be defined in a box, but it should be definable. The photos below are of Jacksonville, FL Model, Shante, who I had the pleasure of working with not too long ago in Editsto, SC. This is the same photo, captured at ISO 64, at f/3.2 and 1/125s using Off Camera Flash lighting. The only thing that has been changed is the exposure is shifted in Adobe Lightroom to reflect the difference of the styles. The Straight out of Camera (SOOC) image is the darkest one. Adjusted for 1 stop, is the image above, or the second image. The third image is adjusted by 2.5 stops. Brightening the subject as well as removing all detail from the sky. I have chosen the middle aesthetic for this post, but that look is not a one size fits all aesthetic. Which one do YOU prefer?